Lao was probably the quietest of the Asian countries I visited when I was traveling. It was calm, peaceful and stunningly beautiful. 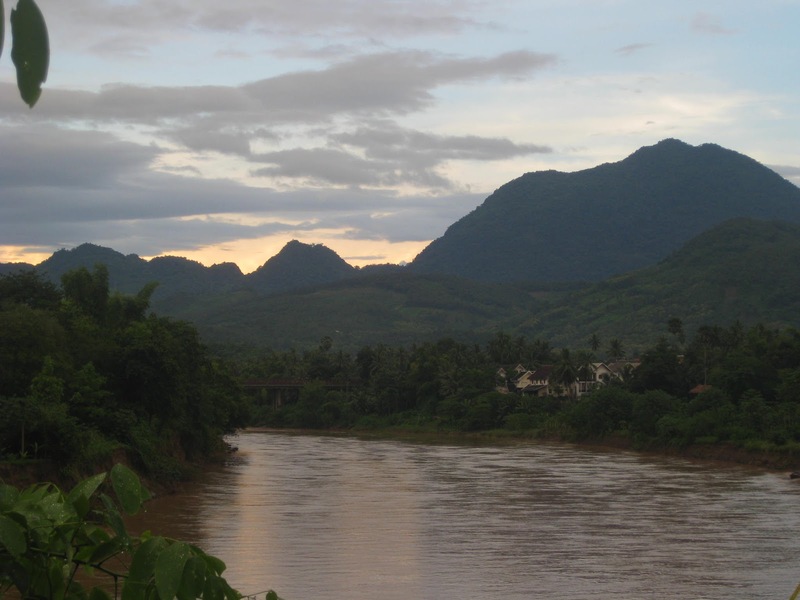 Lao is a very mountainous country, filled with very kind generous people, some of the friendliest in Asia. I happened to be there in August last year, which is their wet season and boy when it rains it pours! 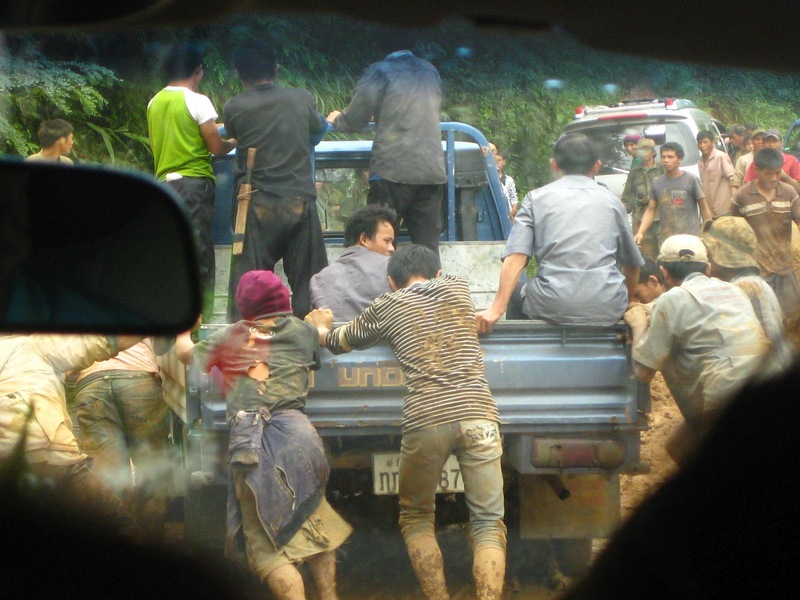 As I said Lao is a mountainous country, which is great to go trekking in but not in wet season, we thankfully decided to get a minibus from Luang Prubang to Vang Vieng instead of the “VIP” bus, which is just a regular bus to anyone from a Western country. We had been driving for about 1 to 2 hours when all of a sudden there was a line of vehicles on the side of the road- at the top of a mountain pass. Our driver who wasn’t the best driver in the world, drove past them and we could see that there had been a landslide onto the road, stopping vehicles getting through. A “VIP” bus had tried and slipped of the side of the road/mountain! Thankfully it had got stuck on the rocks and no one was injured or killed. Some local people were pushing smaller vehicle’s through the mud to the other side, they charged our driver about £1.50 which was going to be spilt between 10 of them! 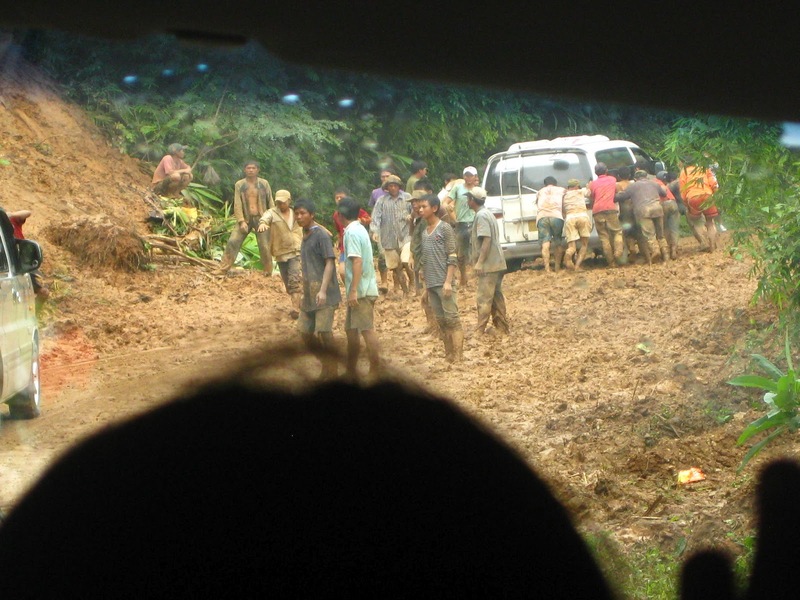 We waited our turn and watched as many cars were guided through the mud to the other side, then it was our turn. The driver decided to rev the engine and drive as fast as poss which in turn spun the back wheels out. I really did think this was the end, we had survived 13 countries over 10 months and now as we were on the last two week leg of our journey we were going to die. I know it sound dramatic now but, I really did think that. Thankfully the guys who were helping us managed to guide us to safety. It was a once and a life time experience that I will never forget, I love the resourcefulness of the people in Lao, it is one of the poorest countries in the world, with no health care or educational system at all! People if they get ill have to cross the board to Thailand if they can afford it. We were in Lao when we heard about the London riots, where people were angry about the poverty they were living in! In England one of the richest countries in the world!… As you can imagine I could not believe my eyes or ears. I am sure if you have read this far down you are thinking how is this escapism? To me it is thinking back on all of the different, sometimes challenging and not so often scary situation, we were in whilst away is weirdly soothing knowing that I took that risk and went away and did something. For me I always knew I wanted to travel the world and was never scared once before I went or whilst we were away a part from this one time. We travelled in total to 14 different countries in 10 months, we stayed in some nice places alot of not so nice places, we camped a lot, slept on buses, boats, cars, hammock’s and trains. We loved every second of it and I can’t believe this time last year we were getting our last flight back home to England. I can’t believe it has been a year it still feels like a week ago, as you have guess, I still love talking about it. If you are contemplating whether to go traveling what are you waiting for?! It will be the best thing you do in life, you will remember it when you are old and grey and are no longer able to rough it to save a pound or two. You will see things that will change the way you think, act and behave and you will met some amazing people, you will stay in touch with for years to come. If I have still not convinced you then just remember you can always come back home if its not for you, nothing would have changed everything will still be hear waiting for you. But at least you would know that you tried and could settle the curiosity within.